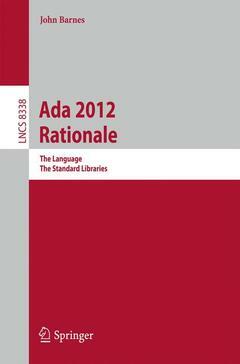 Ada 2012 is the latest version of the international standard for the programming language Ada. It is designated ISO/IEC 8652:2012 (E) and is a new edition replacing the 2005 version. The primary goals for the new version were to further enhance its capabilities particularly in those areas where its reliability and predictability are of great value. Many important new features have been included such as those defining dynamic contracts and for handling multiprocessors and are integrated within the existing language framework in an elegant and coherent manner. The Ada 2012 Rationale describes not only the changes from Ada 2005 but also the reason for the changes. It starts with an introduction providing a general overview and this is followed by seven chapters focusing on contracts and aspects; extended expressions; structure and visibility; tasking and real time; iterators and pools; predefined library and containers. The book concludes with an epilogue largely concerned with compatibility issues. Introduction.- Contracts and Aspects.- Expressions.- Structure and Visibility.- Tasking and Real-Time.- Iterators, Pools, etc.- Overview of changes.- Predefined Library.- Containers.- Epilogue.